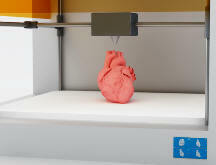 This article by Annie Dike, writing for IMS ExpertServices, writes about a very unique and creative application in courtrooms for the newfangled 3D printers: creating objects that jurors in patent infringement and product liability litigation proceedings can hold in their hands and examine when considering a verdict. Her example includes creating exact (or nearly so) copies of both the original and the contested versions of an invention in order to highlight the similarities or differences, depending on whether you are a defendant or a plaintiff, of the two designs. This could be a great strategy for you or your company if you ever find yourself in a similar situation; maybe you're there right now. Be sure to send Ms. Dike a thank-you note if so. Posted by Annie Dike, Esq. August 18, 2015 Can Google Earth make an assertion? Let’s say in a trial over whether you went to work today, you offer up a Google Earth satellite image that depicts you sitting at your computer typing away. Would that be an assertion that you were at your desk working this morning? Your boss may say the photo could have been taken last week. But what if the image came with a date and time stamp and GPS coordinates? Now that’s proof. But, isn’t that also a statement? Isn’t it hearsay? When faced with the same question, the Ninth Circuit said no. In a recent opinion over the arrest of an illegal alien, a Google Earth satellite image was offered up by the Border Patrol to prove that the defendant was arrested on the states’ side of the United States-Mexico border. See U.S. v. Paciano Lizarraga-Tirado, 2015 WL 3772772 (9th Cir. 2015). The image also included a digital tack with GPS coordinates corresponding to the coordinates the officer logged when the arrest was made. Hence the Google Earth image was essentially an assertion that the defendant had indeed crossed the border and was arrested on United State soil. Or was it? The Ninth Circuit, likening the Google Earth satellite image to a photograph found the image itself was not an assertion because it was merely a depiction of a scene as it existed at a particular time. You, sitting at your desk typing for example. However, the digital tack and GPS coordinates required further analysis. According to the Ninth Circuit, these additions made clear assertions. Like the date and time stamp on your work photo which assert that you were at your desk working at 10:34 a.m. But, is an assertion hearsay? It depends on "who" said it: a human or a machine. The court explained that topography lines added to an image by a human are hearsay because they are a person’s written assertion under Fed. R. Evid. 801(a). The Ninth Circuit joined its sister circuits in finding statements made by a machine, however, do not qualify as hearsay under Rule 801. The question then was whether the digital tack and GPS coordinates that were added to the Google Earth satellite image were made by a machine. The court found they were. Even though a human enters the coordinates to pan to a certain location, he has no role in finding and retrieving the image for the location. The Google Earth program handles this. The tack is placed without any human intervention. Thus, the machine said it, so it is not hearsay. Interestingly, the court did offer up, on its own initiative, a potential angle of attack for Google Earth images: authentication. Because machines can malfunction or be tampered with, if a machine statement is attacked on authentication grounds, the proponent of the evidence must prove accuracy of the process or system which produced the statement. Meaning, if your Google Earth image is challenged, you would have to establish Google Earth’s reliability and accuracy. This could be done by bringing in a Google Earth programmer. Unlikely. They probably all work out of a bungalow in the Bahamas. But, you could also bring in an expert who frequently works with and relies on the program and can attest to its accuracy. This may be a growing trend in the digital fingerprinting area. Our interactions and activities these days are constantly logged in the digital universe. It may seem simpler than ever in this age to show when a file was opened on your computer, where you had dinner last night or how much you transferred out of your bank account yesterday. But, you may need an expert to help establish the accuracy and reliability of the programs that log and track this type of digital information. If you need a witness with digital fingerprinting expertise, IMS ExpertServices can locate them. Metadata experts can help you find, verify, and defend the very types of digital evidence you may not have even known existed, but that can make all the difference in your case. How about it readers, have you seen an increased use and reliance on machine-generated statements in litigation? What types of challenges have you made to such evidence or what obstacles have you seen it overcome? Respond when you have time, of course. For now, you better get back to work. Google is watching.